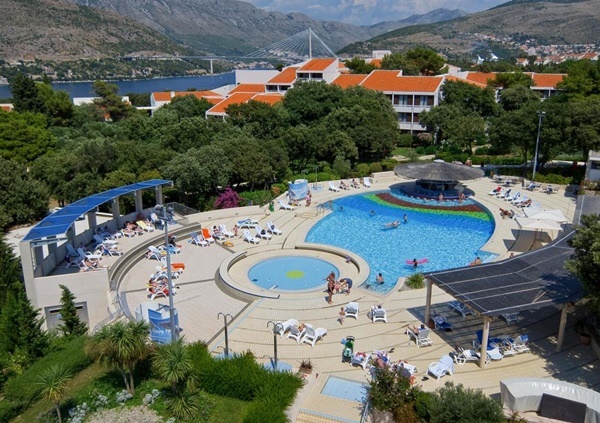 Tirena Sunny Hotel Tirena by Valamar has a great location among pine and olive trees and close to the beautiful beaches in Babin Kuk area. It is the perfect place to escape for a relaxing holiday in Dubrovnik. This hotel is perfect for family holiday. Tirena Sunny Hotel by Valamar has 208 rooms (on 4 floors) decorated with modern furnishings. Room amenities include air-conditioning/heating, en-suite bathroom, satellite TV, mini bar, hair-dryer, direct dial phone, Wi-Fi Internet access. Hotel's restaurant serves a selection of Mediterranean and international dishes. Both breakfast and dinner are served buffet-style. One of the special characteristics of the restaurant is "show cooking". The snack bar Maro offers light meals and refreshments throughout the day. The hotel bar is the perfect place to have a few drinks and the pool bar provides guests with drinks at the poolside. From Hotel Tirena you can easily reach Copacabana and Cava beaches as well as Hotel Dubrovnik President beach. This hotel has outdoor pool (400m2) and shallow children's pool. Deckchairs and parasols are available for the guests. The pool bar provides guests with refreshments at the poolside. As Tirena Sunny hotel by Valamar is a part of the Babin Kuk tourist complex there are many facilities available in the vicinity of the hotel: 8 tennis courts - equipment available for hire, mini golf, table tennis, walking and jogging paths, bowling, football pitch, basketball court, diving centre, pedal boat hire, banana boat rides, water skiing, parasailing. Wireless internet is available in guestrooms and public areas (surcharge). Hotel Tirena has a meeting room which can hold up to 80 participants. Hotel Tirena can be easily reached from Dubrovnik airport. From the airport take the airport shuttle bus to Pile Gate. From there take city bus no.6 which runs to Babin Kuk. If you prefer more comfortable and faster transfer you should prebook a private car transfer from the airport. If you plan to take a day trip to the one of the islands and need to reach Gruz port take bus no.7 from the nearby bus stop.